The first park constructed over a freeway, Freeway Park has a long history of serving to bridge and build community. Lawrence Halprin and Angela Danadjieva, the landscape architects responsible for Freeway Park’s design, envisioned a park that would restore pedestrian access between Seattle’s Downtown, Capitol Hill and First Hill neighborhoods, thereby repairing the gap generated by the development of Interstate 5 through downtown Seattle. After its completion on July 4, 1976, Freeway Park quickly became a popular urban oasis. Over five acres in size, Freeway Park is a maze of unique architectural forms, fountains, plazas and pathways. Its distinct spaces are flexible and lend themselves to large gatherings as well as peaceful solitude. The Park’s 2010 landscape renovation brought attention back to the diverse canopy of mature trees, the series of bright grassy plazas and the array of seasonal blooms throughout the year. Just as the Park acts to bring communities together, its namesake, Jim Ellis served the Seattle community tirelessly as a citizen activist and leader of such campaigns as those that cleaned up Lake Washington and established Seattle Metro in the 1950’s. Jim and Mary Lou Ellis are honored as community visionaries the WSCC Plaza on the North side of the Park. Freeway Park is at once an historic landmark and an ever changing urban landscape that reflects the diverse needs of its community. Freeway Park is City of Seattle public park, managed by Seattle Parks and Recreation. 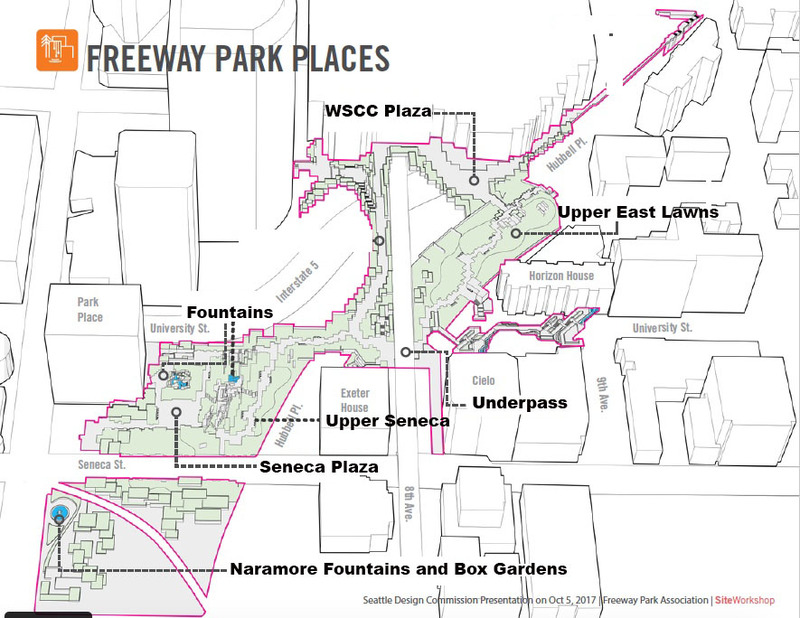 The Cultural Landscape Foundation // Freeway Park: Past, Present and Future?